Garf accompanied the Atlantean when he led his army to invade the surface world, arriving off the coast of the United States of America. This invasion was ill-fated as the undersea army could not survive above water without exploding from decompression. Garf had greater durability than his kin and survived but when his king was arrested, he fled back into the ocean and to his homeland. Many years later, Mako had taken over the throne of Atlantis and he decided to lead his own invasion attempt. This was during Mister Glum’s reign and Mako’s human nature meant that he was susceptible to Glum’s commands. He abandoned his army to get slaughtered by the superhuman slaves present. Garf managed to avoid death and escaped back home where he took Mako’s place and became the new King of Atlantis. When the Tyrrus Combine launched a global assault upon Earth, Mako swam down to Atlantis to seek out their assistance in fending off the invaders. King Garf refused to help as he was happy for the surface world’s ranks to be thinned but Mako refused to accept this decision. 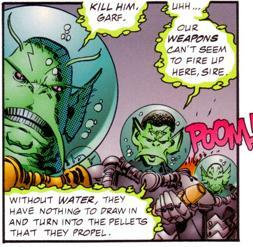 He instead murdered King Garf and simply lied to the Atlantean army about their monarch’s decision, taking them with him to fight the aliens.